I was checking google buzz this morning and I found a post by Joseph Alam about Lebanese blogs being featured in the blogosphere section of Communicate paper-back magazine. 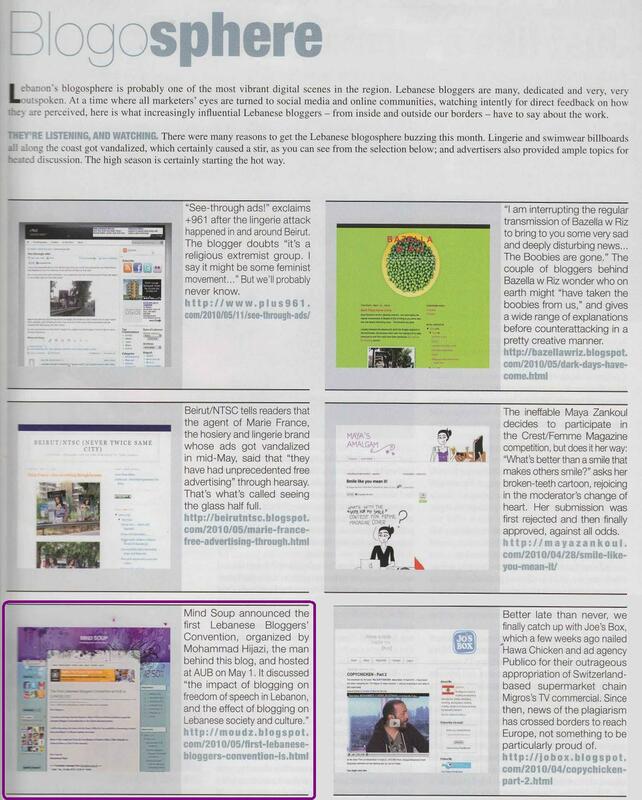 I was surprised to find that Mind Soup was featured in the June 2010 issue for the Lebanese Bloggers Convention at AUB post. Too bad that this event was cancelled due to "special circumstances". Anyway, I will still be working for this event to happen and updates will be posted soon. Anyway, I would like to thank Communicate Magazine for featuring Mind Soup in their blogosphere; it came as a unexpected surprise. Here's the page where Mind Soup was featured.